What are the characteristics of a 403(b) retirement account? What factors may be important in considering whether or not to invest in one? KSTF Fellows are largely young teachers. As a group, we are the demographic of teachers least likely to be concerned with retirement. But we’re also over-achievers, so it’s likely that you probably know you ought to be planning for retirement. Have you looked into it, though? Seriously, who has time for that between differentiated instruction and becoming a teacher-leader? I recently spoke with an investment manager to find out how 403(b)s work so I could decide whether or not I ought to invest in one. Here’s a snapshot of what I learned. Hopefully, this information will be useful to you as you make a decision about whether or not to start a 403(b). It doesn’t happen all that often, but every now and then my bank account actually has more money than I need in it. I don’t know about you, but I don’t like to see too much money in my checking account. It inevitably means I will spend it on some new gadget that was too expensive to consider in my leaner days or ship it out to pay down my mortgage. It wasn’t until recently that I started sending money monthly and automatically to my Roth IRA, a retirement account that allows me to withdraw money tax-free after I turn 59 and a half. In a moment of clarity, I remembered that some of my colleagues had 403(b)s, a type of retirement account specific to teachers and a few other types of workers. I knew that some of them had worked with this one investment manager at a particular firm who also happened to be my friend (you can imagine that Vermont is the kind of place where everyone knows everyone). So I called him up to get the skinny on 403(b)s and determine if I should be splitting my retirement contribution between different types of accounts. I felt like I could trust the advice of my friend to be forthcoming and sound, even though, of course, no one can guarantee future profits when the stock market is involved. My investment manager friend told me to think about retirement income as a three-legged stool. You’ll get Social Security, your pension (a mandatory contribution from your paycheck, put into an account managed by the state), and any retirement account you set up. But you have to set it up. It’s not the sort of thing that is built-in when you sign a contract. It doesn’t happen automatically. Employer-based retirement accounts, like 401(k)s for the private sector and 403(b)s for the public sector, are sanctioned by your employer. And, when you do go to start a retirement account, there are a few choices to make. Do you want an individual retirement account where you get to manage it (if you want), or do you want an employer-based retirement account? The latter may be a little safer, but it’s also more regulated. If you’re looking for an individual retirement account (an IRA), then you should be looking into either a traditional or Roth IRA, but that’s another article. Employer-based retirement accounts, like 401(k)s for the private sector and 403(b)s for the public sector, are sanctioned by your employer. While you can’t invest in just anything (stocks, for example), there is some degree of flexibility and decision-making power you can have over your retirement investments (again, if you want. You could, alternatively, pay someone to manage it for you). 403(b)s tend to be more regulated than IRAs, so they also tend to be a little more vetted as they’re part of an investment firm’s package offering. Ok, so how does this work logistically? As with any retirement account, there’s a maximum amount you can contribute each year. For Roth IRAs, it’s $5,500 per year; for 403(b)s, it’s $18,000 per year or 100% of the match limit of your employer, whichever is less. Retirement plans in general incentivize people to only access it once they’re 59 and a half years old by making them pay a stiff fee if they make withdrawals before then. Because 403(b) plans are highly regulated, they’re only offered through investment companies like Edward Jones, Fidelity, Nationwide, you get the idea, and your school district or union should have a list of companies approved to offer 403(b)s to employees in your school district. Of course every district is a little different, but your union representatives should be able to direct you to those resources. Supposing you wanted to move forward with a 403(b), you would set up an appointment with someone from one of these approved companies. It’s just like setting up a savings or checking account. As with any retirement account, there’s a maximum amount you can contribute each year. For Roth IRAs, it’s $5,500 per year; for 403(b)s, it’s $18,000 per year or 100% of the match limit of your employer, whichever is less. Is there an employer match or contribution? 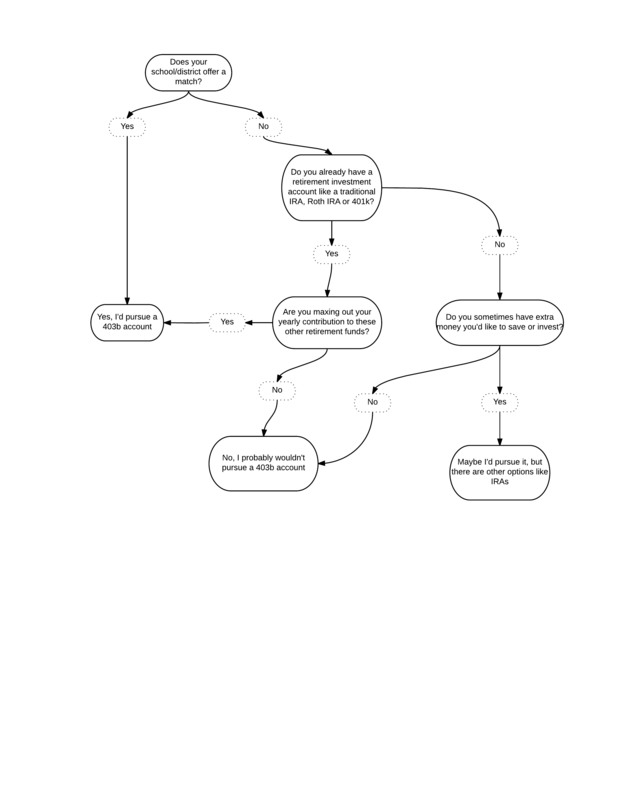 In the decision-making flow-chart of do-I-get-a-403(b)-or-don’t-I?, if your employer offers a match, then your flow chart arrow skips all the rest of the chart and lands directly on “YES, DO IT NOW” (Figure 1). Because then it’s a 100% investment: for every dollar you put in, you make another dollar, automatically, from your employer before you even get started. The stock market only gets like 9.9%. Alas, my school district doesn’t offer a match, so harumph, back to the flow chart. What if I already have an IRA? If you already have an IRA, there’s probably no need to get a 403(b) unless you’re maxing out yearly contribution now or your household is making a lot of money. For dual-income households, where, say, one partner is making bank, then it probably makes sense to have multiple retirement accounts. Ideally, you want to be saving about 10% of your income, and you may be too limited by the yearly maximum contribution amount with just one account. If you’re like me, you’re not even close to hitting that mark. I’m certainly not maxing out my yearly contribution with my IRA. Since I have a Roth IRA (I pay taxes on the money I contribute now, but then this money will be tax-free when I draw it down once I retire), I don’t invest the yearly maximum in my current IRA, and my school district does not offer an employer match, I decided to not start a 403(b) account. But if you don’t have a retirement account, you should definitely look into it. I don’t need to tell you about the value of compounding interest and why starting a retirement account early on is significantly more beneficial than starting it later, but just for kicks: according to the investment manager, if you put away only $50 per month into a retirement account that sees the same growth as the stock market for 30 years, that’ll be an extra $150,000 upon retirement. That sounds like a worthwhile investment to me! Keep in mind, none of this is advice from an actual financial planner. I am a mere mortal. For more information, meet with a financial advisor. Should I get a 403(b)? 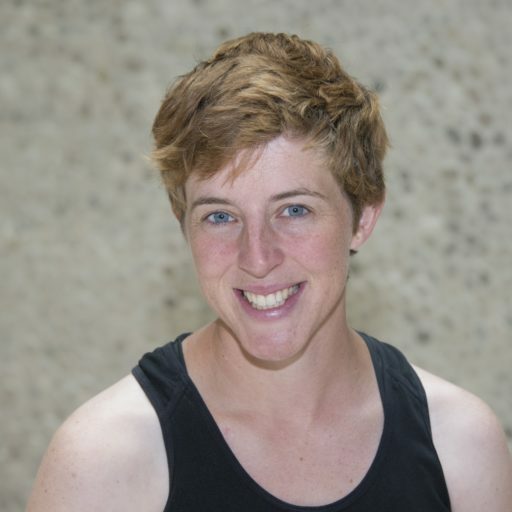 Anne Watson is a Knowles Senior Fellow who teaches physics, engineering, and math at Montpelier High School, in Montpelier, VT, where she has taught for the past 12 years. Outside of the classroom, Anne coaches ultimate frisbee and serves on the Montpelier City Council. Anne can be contacted at anne.watson@knowlesteachers.org. Watson, A. (2016). Teachers’ lounge: To 403(b) or not to 403(b). Kaleidoscope: Educator Voices and Perspectives, 3(1), 7–10. Over the course of a year, I engaged in strengths-based observations of my colleagues.